Luxury brand Christopher Guy (CG) will once again sponsor the upcoming Hollywood Beauty Awards on Sunday, February 25, 2018 at the historic Avalon Hollywood. The Hollywood Beauty Awards recognize the incredible talent of beauty professionals in Music, Television and Film, as well as for editorial and the red carpet. Honoree awards are presented for outstanding achievements in hair, makeup, styling and photography. Pre-announced special honorees include Britney Spears (Fragrance of the Year, Fantasy in Bloom), Smokey Robinson (The Gentleman Award), and Jane Seymour (Timeless Beauty Award). Presenters include Elizabeth Banks, Samuel Jackson, Lionel Richie, Marie Osmond, Tommy Chong, Cheech Marin, Danielle Savre and more. "The sheer brilliance of the unsung heroes of every production, photo shoot and red carpet event is simply incredible. Their challenge is to create a visual identity that remains central to the artist's onstage character, be it beauty, unsightliness, sadness or joy," said Christopher Guy Harrison, founder and lead designer for CG -- and designer of the "Holly" award. "It is an honor for us at CG to recognize the achievements of all those stylists who stand anonymously and silently behind the scenes, and yet whose work screams volumes." The black-tie gala benefits the Helen Woodward Animal Center. Other sponsors include Moët & Chandon, LaDove, and Rikoko. Christopher Guy Harrison, an award-winning internationally renowned designer, is the founder and CEO of luxury furnishings brand, Christopher Guy. His creations were brought to life in the mid-90s when he set out to create the world's most fabulous and unique mirror frame collection under the name Harrison & Gil. He began building his workshops after acquiring a plot of land in Java, where he sourced the best craftsmanship from local artisans. Today, these workshops cover more than one million square feet, and Christopher Guy has evolved to creating a complete luxury lifestyle that offers timeless values. With presence in over 42 cities including showrooms throughout North America, Europe, Asia, and the Middle East, Christopher Guy offers a fresh approach to design, transcending modern, traditional, and cultural boundaries. Christopher Guy creations are selected by leading designers and retailers, from the grandest hotels and most spectacular resorts, to the world's finest residences. The brand's stylish appeal and often-elaborate aesthetics have led to cameo roles in many iconic movie productions such as Casino Royale (007), Ocean's Thirteen, The Hangover, The Devil Wears Prada, Charlie's Angels 2, and The Interview. Whether as statement pieces in luxurious hotels or on Hollywood film sets, Christopher Guy's timeless and elegant designs are widely acclaimed as the world's most fabulous decorative furnishings. Note: Nearly all the movie extras were on the previous DVD anniversary edition. In 1978, Cheech Marin and Tommy Chong made their feature film debut in UP IN SMOKE, the outrageously funny classic inspired by their now legendary comedy routines of the early '70s. Following massive success with over 10 million comedy albums sold, four Grammy nominations and a win for Best Comedy Recording for "Los Cochinos," Cheech and Chong took Hollywood by storm when UP IN SMOKE became a smash hit, establishing the pair as the reigning comedy duo of a new generation. Today, the film still has viewers rolling in the aisles and maintains surprising cultural relevance four decades after its original release. "The greatest thrill is making your first movie and this one has been seen and been influential all over the world for over forty years," said Richard "Cheech" Marin. 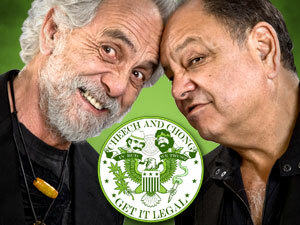 "Up in Smoke started stoner movies and is still going strong so smoke it up one more time." "Where did the time go? 40 years ago we made low budget movies that grossed over 100 million and are still being watched all over the world! And it also helped legalize an important medicine," said Thomas Chong. "I am so proud that a movie bearing a title of a simple song I wrote would be so influential for so many years." 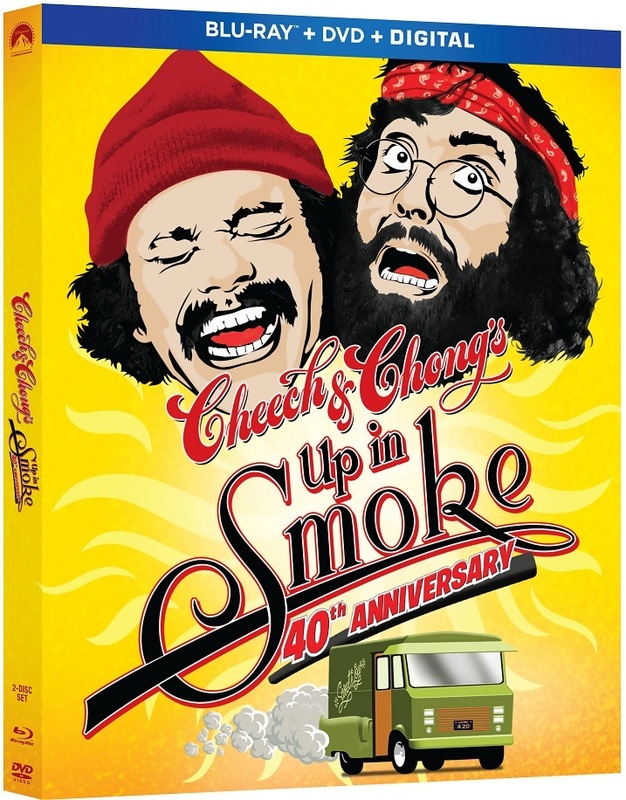 The UP IN SMOKE Blu-ray Combo Pack features a brand new short-form documentary entitled "How Pedro Met the Man: Up In Smoke at 40," which chronicles the duo's comedy history, as well as the origins and impact of the film itself. Capturing a complex and fascinating pop culture odyssey, the documentary incorporates new interviews with Cheech Marin, Tommy Chong and producer/director Lou Adler along with archival footage. The Combo Pack is also loaded with previously released bonus material including deleted scenes, commentary, a music video and more. 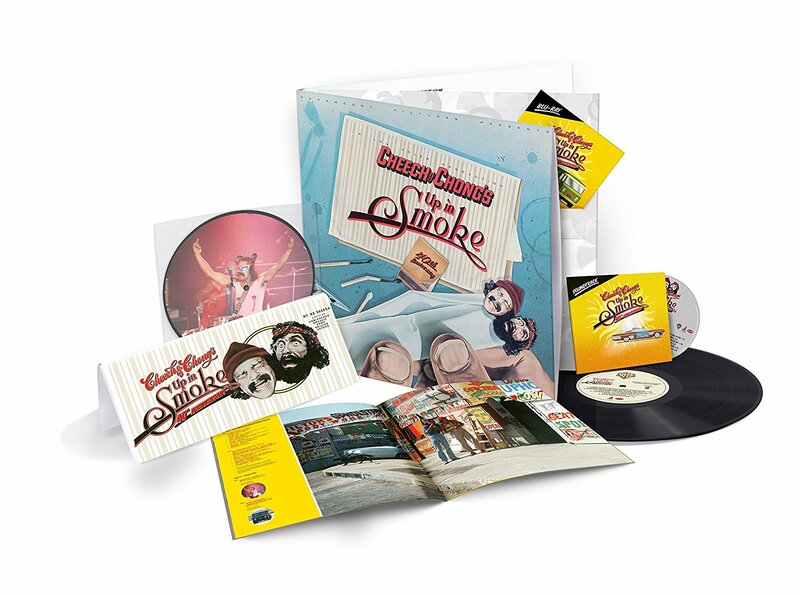 The UP IN SMOKE Deluxe Collector's Edition is presented in a 12×12 package, limited to 5,000 copies. The set pairs the Blu-ray with the original soundtrack on CD and VINYL LP, as well as a 7-inch picture disc, oversized "Up In Smoke" rolling papers, a film poster, and booklet with new essays by both Cheech Marin and Tommy Chong, along with rare and unseen photos. In addition to the new version of "Up In Smoke," the CD also features another previously unreleased version of the song from 1978 with an additional Spanish verse by Cheech. Cheech & Chong's "The Man Song"
Presented with: English 5.1 DTS-HD Master Audio, French Mono Dolby Digital, Spanish Mono Dolby Digital, Portuguese Mono Dolby Digital and English Audio Description and English, English SDH, French, Spanish and Portuguese subtitles. The DVD in the Combo Pack is presented in widescreen enhanced for 16:9 televisions with English 5.1 Dolby Digital, French Mono Dolby Digital, Spanish Mono Dolby Digital and English Audio Description and English, French, and Spanish subtitles. "2018 version" of "Up In Smoke"
11×17 film poster with original, tagline "Don't Go Straight To See This Movie"